Do you know an outstanding educator? Someone who meaningfully imparts the treasures of Jewish life and Judaism? Nominations are now being accepted for the Marion B. Steeg-Henry Grinspoon Award for Excellence in Jewish Education. This award highlights the value of Jewish education in its many varieties in our community not limited to specific institutions or classroom teaching. In addition to classroom teachers, song leaders, camp educators, independent Jewish educators, and tutors are also eligible for the Steeg-Grinspoon Award. The only requirement is that a nominated educator must be involved with a group of Jewish students and/or Jewish learning community on a regular basis, meaningfully imparting the treasures of Jewish life. Anyone can nominate an educator and the one-page nomination forms can be accessed here. Additionally, nominations may be submitted using the form below. Completed nomination forms are due to Michelle Neal at michelle@jewishnola.com by February 28, 2019. Once nominations are received each nominated educator is contacted to let them know they have been nominated and for them to complete a form with additional information illustrating their teaching methods, strategies, and why they do what they do. The award is presented at a reception hosted by Robert and Pamela Steeg, and the award is named in honor of Robert’s mother. While she was not a formally trained educator, by experience and instinct she genuinely appreciated the importance of a Jewish education and a grounding in Jewish values. The awardee will receive a plaque from the Harold Grinspoon Foundation, listing on the Harold Grinspoon Foundation website, an invitation to participate in an online community of practice, and $1,000 towards future educational enrichment. Since 1991, the Harold Grinspoon Foundation has invested more than $200 million in programs that make Jewish life and Jewish community more vibrant and more connected. They are a major contributor to the PJ Library and PJ Our Way programs. For more information, please click here to print the Steeg-Grinspoon Award flyer, or contact Michelle Neal at 504-780-5604. For more information, see http://hgf.org/JEd-Awards or email TeacherAwards@HGF.org. 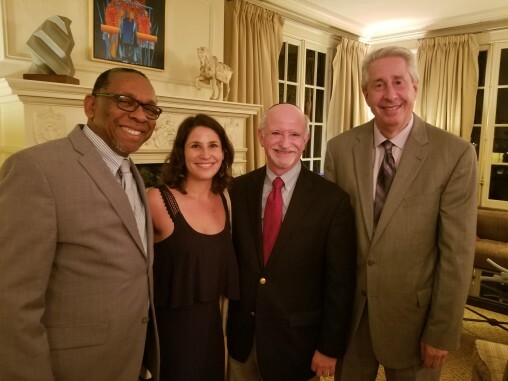 Dr. C. Reynold Verret, President of Xavier University was the keynote speaker at the May 2 event honoring Alysse Fuchs, the second annual awardee of the Marion B. Steeg – Harold Grinspoon Award for Excellence in Jewish Education. Dr. Verret spoke of the similarities between the African- American and Jewish communities, and the challenges faced in education. Other speakers included Arnie Fielkow, Jewish Federation CEO, host Robert Steeg, and Rabbi Robert H. Loewy, the Chair of the Steeg – Grinspoon Selection Committee. Alysse Fuchs was nominated for the award by her supervisor at Avodah Jewish Service Corps, New Orleans, Dani Levine. Alysse’s passion for social justice and Jewish education impressed the Selection Committee, as well as the attendees at the reception. Alysse spoke eloquently and enthusiastically about her efforts to blend education and social action in her work as the Program Director at Avodah and as a previous religious school teacher at Touro Synagogue. The event was hosted in the home of Federation supporters Rob and Pamela Steeg. The Marion B. Steeg – Harold Grinspoon Award for Excellence in Jewish Education is an award that highlights the value of Jewish education in its many varieties in our community. To be nominated, educators must be involved with a group of Jewish students and/or Jewish learning community on a regular basis, meaningfully imparting the treasures of Jewish life. To learn more about the Marion B. Steeg - Harold Grinspoon Award for Excellence in Jewish Education, please click here.